Alty Conservancy protects Kiskosh Lagoon and Alty Lake – an area of high value for grizzly bear and bird habitat. This conservancy borders with K’Mooda/Lowe-Gamble Conservancy, K’waal Conservancy and Klewnugget Conservancy which together protects a network of inland lakes. 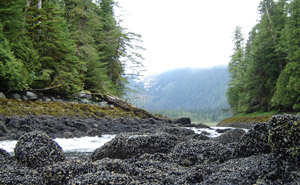 Alty Conservancy contains three remote pristine lakes, old-growth forests, several streams and wetlands. It has a diversity of wildlife habitats along with mountain scenery. Access into this wilderness area can be difficult and usually requires air transportation. Do not take motorized boats through the tidal narrows at the end of Kiskosh Inlet and entrance to Kiskosh lagoon. There are large rocks and your boat will be trapped in the lagoon at low tide. Alty Conservancy is only accessible by boat, floatplane or helicopter and is located about 10 km north of Hartley Bay and 70 km south of Kitimat. The conservancy is located at the end of Kiskosh Inlet and is bordered to the southwest with K’Mooda/Lowe-Gamble Conservancy, to the northeast with K’waal Conservancy and to the west with Klewnugget Conservancy. History: Alty Conservancy was designated as a conservancy on May 31, 2007 following recommendations from the North Coast Land and Resource Management Plan. Cultural Heritage: The conservancy is in the asserted traditional territories of the Gitga’at and Gitxaala First Nations. First Nations people historically fished, hunted and trapped in the area, using a trail system stretching from Kiskosh Inlet to Lowe Inlet. Use the below link for more information or to contact these First Nations. Gitxaala First Nation: No website at time of publishing. Conservation: The conservancy protects undisturbed old-growth forests of cedar and hemlock, wetlands, wildlife habitat and the watersheds of Alty Lake, Backlund Lake and the southern half of Gavel Lake. Kiskosh lagoon and Alty Lake have high values for grizzly bear and bird habitat. Wildlife: Grizzly bears, wolves and waterfowl can be found in Kiskosh lagoon. BC Parks is in the process of developing a joint management plan for K’waal Conservancy and Alty Conservancy. There are canoeing and kayaking opportunities in Kiskosh lagoon, Alty Lake, Backlund Lake and Gavel Lake, however access into these areas is difficult and usually requires air transportation. There are opportunities for trout, char and Coho fishing in the lakes and streams in this conservancy. Please consult the appropriate non-tidal fishing regulations for more information. Anyone fishing or angling in British Columbia must have an appropriate license. Swimming is possible in the lakes, but the water is cold all year-round. There are no lifeguards on duty in the conservancy. Waterfowl, bears, wolves, moose, deer and fubearers may be seen in the conservancy. There are winter camping opportunities in this conservancy but access may be a problem if the lakes are frozen over.